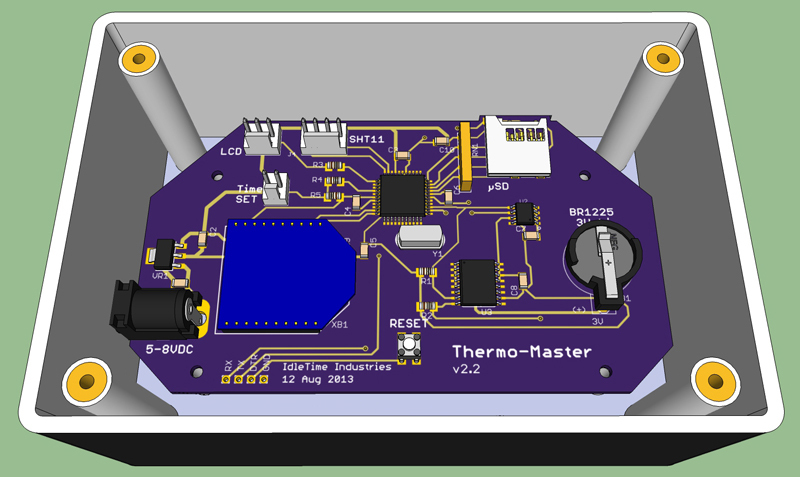 The ThermoProp system consists of three modules, all utilizing a P8X32A (Propeller) microcontroller for a brain. This project originally started as an upstairs/downstairs thermostat, but has morphed into a data logger. I may eventually add a fourth module to interface to my home HVAC system. Currently the system logs temperature & humidity from outside and the upstairs of my house, and only temperature from the downstairs of my house. Data is communicated wirelessly via XBee and logged to μSD every 15 minutes. The Outside unit (Thermo-Slave) is mounted to an outside wall of my house (with a Velcro strip). A location was chosen that is shielded from direct sunlight. The module is powered by 3 AA batteries. Typical battery life is on the order of 70 days. A Sensirion SHT11 temperature/humidity sensor is used to measure the outdoors temperature and humidity. 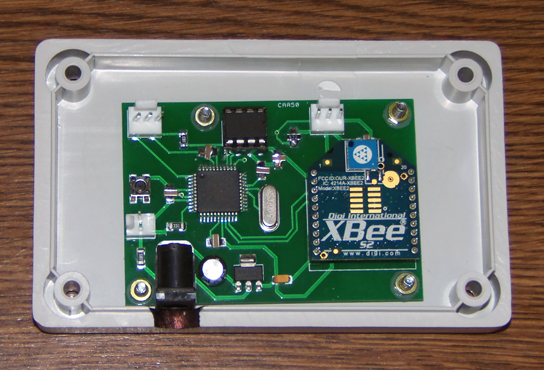 An XBee Wireless RF module transmits the local data to the Master unit. Since it is battery powered, this unit spends most of its time in low-power mode, only waking up every 10 minutes (roughly) to take a reading and transmit the data. Without the power-down, the batteries will only last 7-8 days! When first powered on, the Master unit will display the current date and time, updated every second, and the local temperature and humidity, updated every 5 seconds. The outdoors unit is the key to the data collection effort. In the battery-powered Outside unit, the Propeller and XBee are put into a low-power mode, with the Propeller doing a slow count. Approximately every 10 minutes, the Propeller powers-up, wakes up the XBee, gets a reading from the SHT11, and transmits the temp/humidity to the Master unit. The Propeller then puts the XBee back to bed, and returns to low-power mode. When the Master receives the Outside data, it stores it and displays the data on the LCD. It then sends the local (upstairs) temperature to the Downstairs unit. The Downstairs module will store this info and update the data on its own LCD. It will then transmit the local (downstairs) temperature back to the Master unit. The Master again stores the data and updates the LCD. Outside unit sends outside temperature and humidity to Master unit every 10 minutes. After receiving the outside information, the upstairs temperature is sent to the Downstairs unit. Upon receipt of Upstairs information, Downstairs temperature is transmitted to the Master. The hardware was constructed on a breadboard for testing, then the schematic was created in Eagle and a circuit board manufactured. All the ICs on the board are mounted in sockets. Input power is provided from a ‘wall wart’-type adapter, providing 7.5 VDC through a standard 2.1mm DC plug. Voltage regulation is done by an LM2940 providing +5 VDC, and a MIC39100-3.3 regulator providing the +3.3 VDC. The microcontroller is a Parallax P8X32A (Propeller) in the –D40 package, with the program stored in a 24LC512 Serial EEPROM. A DS1307 RTC is powered from the +5V rail, and is battery-backed with a BR1225 Lithium coin cell battery. 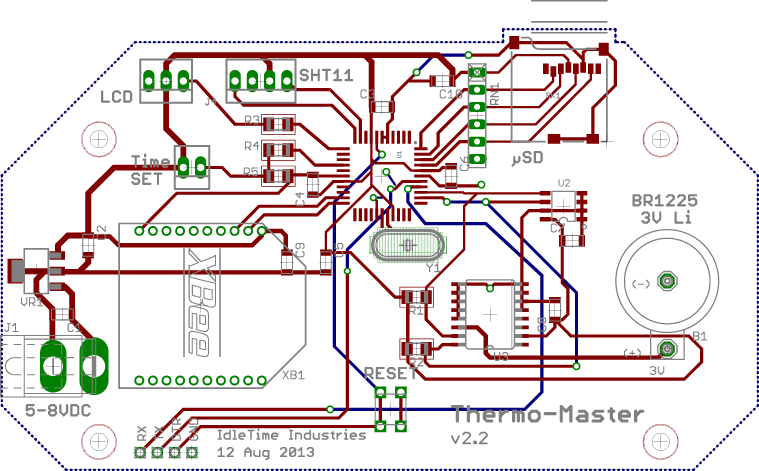 A Parallax SHT11 temperature/humidity sensor module is mounted on a remote corner of the pcb. The module is powered by 3.3V. The module is mounted in an 8-pin socket on the pcb. The XBee Wireless RF module is mounted in the required 2mm sockets. It is an Xbee 2mW Series 2.5 Chip Antenna. When I purchased another unit recently for doing some breadboarding, I purchased this as Xbee 2mW PCB Antenna - Series 2 (ZigBee Mesh). The XBee was configured using the X-CTU configuration software and set as ZNET 2.5 COORDINATOR AT. Connection to the LCD is provided via a three-pin header. The LCD is a 4-line by 20-character format, with a serial backpack (LCD117 from Modern Device, http://shop.moderndevice.com/). The LCD is also powered by +5V. A two-pin header provides a connection for the pushbutton (normally open) switch. The pushbutton switch input to the Propeller is pulled to ground via a 10K resistor, and goes high (3.3V) upon switch closure. The pin is current-limited via an inline resistor. 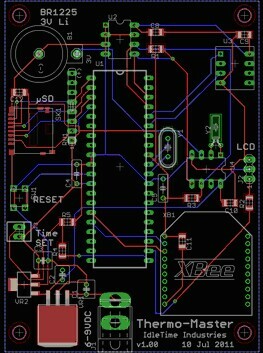 A small tactile pushbutton is also soldered to the pcb which provides a RESET function for the microcontroller, when pushed. The main program first initializes the communications (FullDuplexSerial4port), then inits the LCD display. 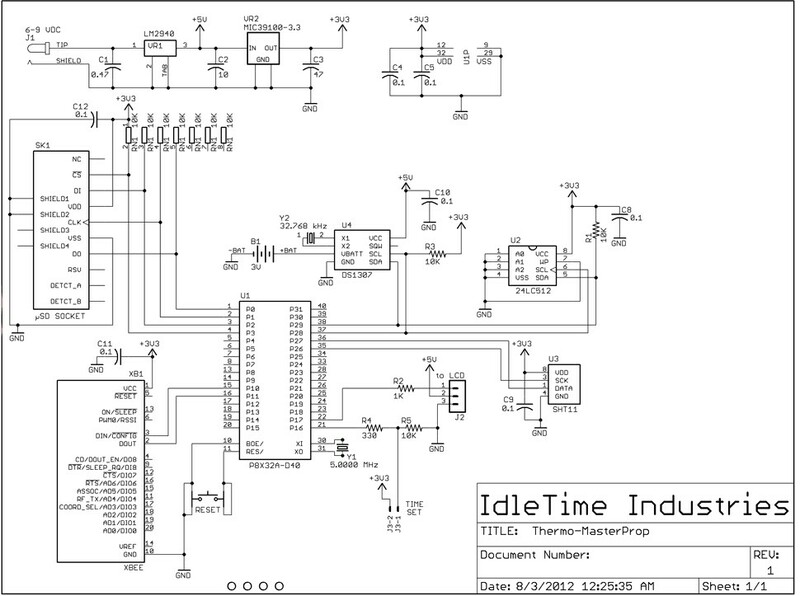 The real-time clock (DS1307_RTCEngine) cog is started and the time is read and stored. Next, cogs are started that read the temperature/humidity (uses Sensirion_full), monitor XBee communications, monitor the pushbutton, and write to µSD (uses fsrw). The program then enters a loop that monitors various flags (SettingRTC, NewOutTemp, NewDwnTemp, NewLocTemp) and calls subroutines based on the state of the flags. It also updates the time display once a second. This cog starts the cog for reading the SHT11, then takes a reading from the sensor every 5 seconds. After getting the temp/humidity data, a flag ‘NewLocTemp’ is set, indicating to the main program loop that the LCD should be updated. the transmission is from the downstairs XBee. The rest of the transmission is parsed and stored as the downstairs temperature and a flag is set ‘NewDwnTemp’ to indicate that the main loop needs to update the downstairs temperature displayed. T: this is a request from the downstairs unit for the current date/time and outside temp. A function is called to send the requested data. O: this is a transmission from the outside unit. 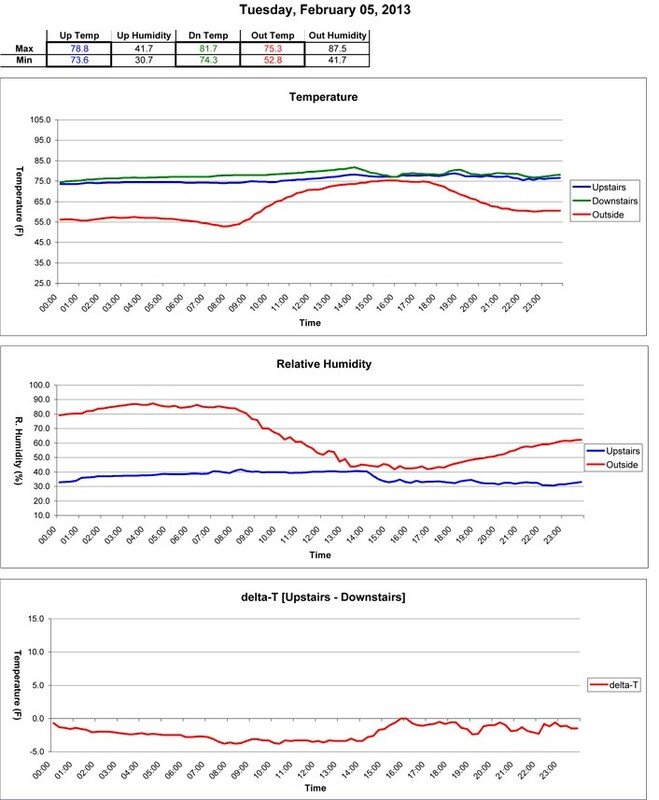 The temperature and humidity are parsed from the data string and stored, and a flag set ‘NewOutTemp’ to indicate to the main loop that the outside temperature has updated. The upstairs temperature is sent to the downstairs unit before resuming. When this cog is launched, it retrieves the date/time info and uses that info to produce a filename in the format ‘yy-mm-dd.csv’. The µSD card is mounted and a file opened. A header indicating “=== REBOOT ===” is written before the standard data header. This indicator is only written at cog initialization and can be used to see that the system restarted for some reason. The cog then enters a loop monitoring the current date/time. On the quarter-hour, the drive is mounted and the current data is written to disk. Each midnight, a new file is opened for that day’s data collection. A data header is written at the top of each new file. This cog runs in a loop waiting for a button press. When a button press is detected, the cog sets a flag ‘SettingRTC’ to indicate to the main loop that the time-setting function should be called. The time-set routine uses short button presses to increment the current variable (year, month, day, etc) and long button presses to indicate that the current data is correct and to move to the next variable (after setting year, moves to setting month, etc). Input power is provided from 3 AA batteries, provided through a 2-pin header. The batteries are contained in a standard plastic 3-cell holder. The holder is mounted to the inside of the case with a Velcro strip. Voltage regulation is done by a REG102 low-dropout regulator, providing +3.3 VDC. The microcontroller is a Parallax P8X32A (Propeller) in the D40 package, with the program stored in a 24LC512 Serial EEPROM. A 4-pin header provides connection to a Sensirion SHT11 sensor mounted on a remote board. The remote sensor board is drilled to allow use of the Sensirion SF1 Filter Cap. This cap mounts over the sensor and provides protection while still allowing relative humidity measurements. The board is mounted so that only the cap extends through the top of the case, and is sealed with a little Sugru. An XBee Wireless RF module is mounted in 2mm sockets. It is an Xbee 2mW Series 2.5 Chip Antenna. When I purchased another unit recently for doing some breadboarding, I purchased this as Xbee 2mW PCB Antenna - Series 2 (ZigBee Mesh). The XBee was configured using the X-CTU configuration software and set as ZNET 2.5 ROUTER/END DEVICE AT. The XBee SLEEP_RQ pin is wired to the Propeller, so that the XBee may be put into low-power mode when not needed. The program first initializes the communications with the XBee (Simple_Serial). A cog for reading the SHT11 is launched, and a cog for data transmission is started. The main program then ends. When this cog is launched it starts the SHT11 object (Sensirion_full), then takes a temperature/humidity reading and stores this info in Hub memory. 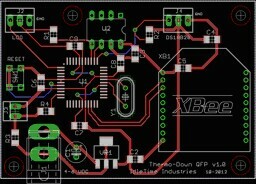 At startup of this cog, the XBee sleep pin is taken low to wake up the XBee module. 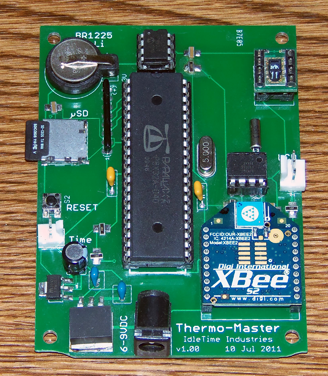 After a short delay to allow the XBee to get ready, a function is called which transmits the temperature and humidity values from the Hub memory. 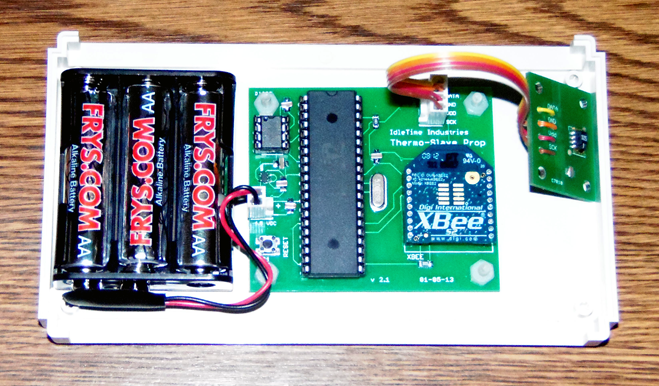 After another short wait, the XBee pin is driven high to put the XBee into a low-power mode. After the XBee is sent to sleep, the cog_Temps cog is stopped, and a function is called that drops the Propeller into a low-power mode (running at 5 MHz with no PLL). A loop is entered which counts up to 600 seconds (10 minutes). At the end of the count, the Propeller is returned to 80 MHz with PLL operation, and the cog_Temps cog is restarted. 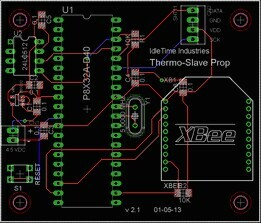 The XBee is then taken out of low-power mode and the temperature/humidity data is sent. The system is returned to low-power mode (as before) and the 10-minute countdown starts again. The hardware was constructed on a breadboard for testing, then the schematic was created in Eagle and a circuit board manufactured. Input power is provided from a wall wart-type adapter, providing 5 VDC through a standard 2.1mm DC plug. Voltage regulation is done by an MIC391000-3.3WS providing +3.3 VDC. The microcontroller is a Parallax P8X32A (Propeller) in the QFP package, with the program stored in a 24LC512 Serial EEPROM. The EEPROM is mounted in a socket. A three-pin header provides connection to a DS18B20 One-Wire Digital Thermometer. 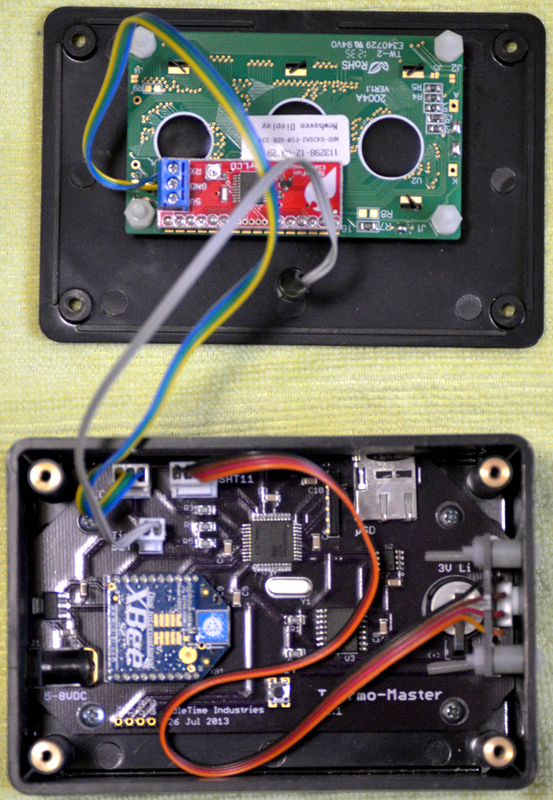 The temperature sensor is mounted in a hole in the top of the case, sealed underneath with a little Sugru. Connection to the LCD is provided via a three-pin header. The LCD is a 2-line by 16-character format., This is a serial-enabled, 3.3V, White on Black LCD, purchased from Sparkfun Electronics (http://www.sparkfun.com). The main cog initializes two communications ports (FullDuplexSerial4port), one for communications with the LCD, the other to talk to the XBee. The DS18B20 is then initialized (jm_1-wire) and checked. Other cogs are then started, to read the temperature on a timed basis, to handle sending and receiving data, to keep the LCD updated, and to watch for button presses. The main cog then shuts down, with all of the work being handled by the launched cogs. Reads the temperature from the DS18B20 and stores the return in Hub memory, then sets a flag TempUpd to indicate new temperature data. Waits an interval (currently 5 seconds) and repeats. This cog runs in a loop watching two flags, TempUpd, indicating the local temperature has updated, and NewUpTemp, indicating that the remote (upstairs) temperature has updated. The LCD is then written with the new information. U: the transmission is from the upstairs XBee. The rest of the transmission is parsed and stored as the upstairs temperature and a flag is set NewUpTemp to indicate that data has updated. T: this is the current date/time and outside temperature, sent from the upstairs unit. The LCD is cleared and the date/time displayed on the first line, with the outside temperature displayed on the second line. After a period of time (currently 5 seconds), the LCD screen returns to the normal upstairs/downstairs temperature display. 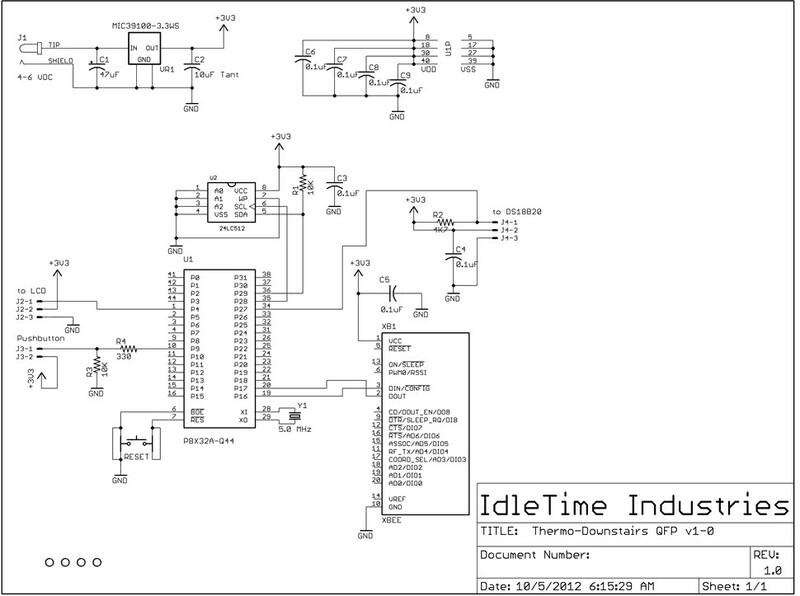 This cog also transmits the request for the upstairs temperature data when the appropriate flag (AskForTime) is set. This cog runs in a loop waiting for a button press. When a button press is detected, the cog sets a flag AskForTime to indicate that the Master unit should be queried for the current date/time and outside temperature. Wow, I did I miss this. I keep wanting to try something like this. Thanks for documenting it so well. Great work. 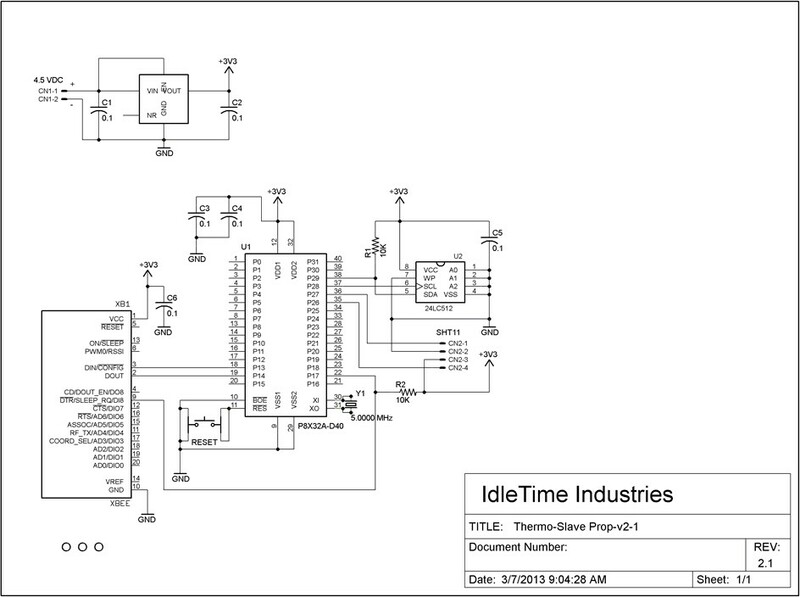 I like the Company name, Idle Time. Gees, wish I had some of that!!!! Great project and documentation, Thank's for sharing. Reminds me of a funny thread a while back. Some poor guy was going broke paying his A/C bill 'cuz his wife & kid were always cranking the thermostat temp way down on hot days. He'd raise the temp setting and leave for work, only to return to a frosty-cold house at day's end. No amount of pleading or reasoning would stop. Think he tried a lock box but they thwarted that too. His last resort was to install a dummy thermostat they could twiddle all they want and hide the real thermostat somewhere else. Maybe a password encrypted, Bluetooth, hi-fi, wi-fi, real-time, algorithm-controlled, spread spectrum, feed-forward, linear interpolating Linux-based embedded solution thermostat would be in order... Or is there an app for that? Nice project, working on a similiar project but keep getting distracted! This is really cool. Thanks for posting this. If I can't pull this off with the basic stamp I'll try this. This project has been up for a well deserved move to Customer Projects from Robotics. I'll have to ask John if I can let go of the Eagle files, but the schematics are included in the thread. How did I never see this thread??? This is a brilliant project, well documented, and well executed. I may utilize some of this design for a project I have planned for the winter. Very similar concept with 16 SHTxx modules but communicating over WiFi or directly connected SHT11 modules via CAT5 cable. (the beginnings of a whole house environmental monitoring system). Sensirion has newer sensors that are cheaper and much smaller so this design could be really small. Andrew, That's why I brought it up from the depths. It is worthy of being resurrected as a great Propeller Project. John let me publish the Eagle files. I actually re-worked the Master Unit hardware since I posted this project. I'll try to get the update posted in the next day or so. @Publison thanks for posting this project to this forum catagory. I had forgoten that John was "Idle Time Industries. 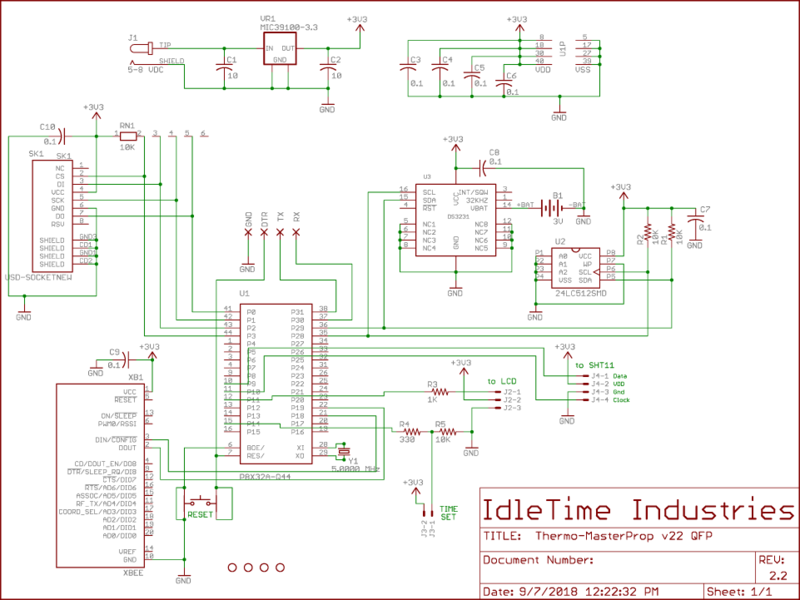 I have two of "Idle Time Industries" Propeller bread boards that I have been using in a project of my own that involves energy management. John, you can see and probably recognize your board in the photo I attached on the Tachyon 5 in Propeller 1 forum. Unfortunately, I fried one of the boards I think by shorting out the power. I haven't had time to trouble shoot it but soon will put a meter to it to see if it is a power problem or what. I just know that the Prop Tool will no longer see a propeller when I do a hardware present query. @Andrew, what are the new Sensiron modules? Excellent project, glad it got moved over to this area. I have a weather station that I built that focuses on low power consumption that is recharged by solar on my patio. It uses many of the same sensors and I thought about adding a XBee to retrieve the data from my computer but left it saving to a µSD card. It can run for years saving data, so far it's ran 45 days before I wanted to check it and plot data points. I track, Pascals, PSI, Temp, Humidity and Dew Point. A+ documentation, thanks for sharing. I reworked the hardware for the master unit, moving to all surface mount parts. I moved the SHT11 off onto its own small board; it's mounted in the side of the box now. Thanks for updating the thread, but all your new links are broken. Nevermind, they are starting to come online. I like the new Master. Good luck with that RTC. That is the exact board that I have. Thanks for the schematic on the board. It will help me trouble shoot the dead one. RTC is running well now that I have cleaned up the wiring and properly installed the pullups. Well, I was thinking the SHT21 in the I2C format, but I see that Sensirion obsoleted those and now has SHT3x-DIS series of parts for the format I was thinking of. The part is 2.5mm square, 0.9mm high in an 8 pin DFN package. You can also buy them with a filter membrane already on the part so it's ready to go for IP67. Single piece pricing at Mouser is $5.81 as opposed to the old SHT11 single piece pricing of $16. However, nowadays, most people are using the cheaper Chinese knockoffs like the DHT11/DHT22/CM23022 that are using a thermistor with built in MCU to provide temps. Andrew, thank you for the input. I like $5.81 as opposed to $16. I put the meter on the breadboard this morning and confirmed my worst fears. The voltages are all present and correct. It looks like I fried the Prop chip. Guess if I ever want to use that board, I will have to purchase a DIP Prop.